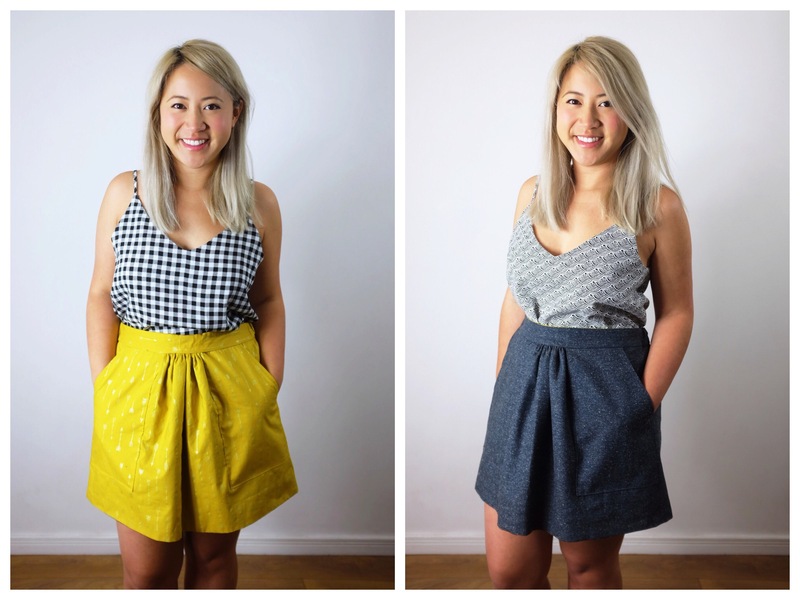 This month’s make is the Cali Faye Basic Pocket Skirt (if you couldn’t tell that from the title!). It’s a sweet and simple design with big pockets on the front and an elasticated waistband on the back. Now before I actually got my hands the pattern, I had a few ideas on what I wanted to do just based on the photos. Mainly that I wanted to see if I could make this skirt reversible! Of course, when I actually did get the pattern I found out it had a zip insert on one side which I didn’t expect considering the elastic back. That put a spanner in the works. So after a lot of thinking I decided that I would just go for it and alter it to make the design reversible like I’d imagined! I chose 2 very different weighted fabrics for this skirt – a blue tweed that I picked up at a fabric swap and this gorgeous mustard arrow print cotton from Studio Jepson. I cut out all the pattern pieces needed twice, once in each fabric, except for the waistbands. You only need one set of waistbands in each fabric. I assembled the pockets on both skirt fronts as normal. I then sewed the front and back skirts together so I ended up with two skirt “tubes”. After pressing the seams open, I placed one “tube” inside the other, wrong side together. I now planned to treat this skirt as one piece. That meant that I gathered the front skirt between the two pockets with a basting stitch that went through both fabrics. Now for the tricky bit – getting that waistband attached! My plan was to keep the front band flat and keep all the elastic in the back of the skirt. That would keep the general design of the dress pretty much the same. So I stitched the waistbands of each fabric as normal and then stitched them together, exactly like you would with a facing. Then I stitched one side of the waistband to the skirt making sure to match the right fabric of the skirt to the correct waistband. At this point I chose to put the elastic in. I did this by cutting a piece to the correct length and stitching each end into the side seam of the waistband. I then folded over the waistband, tucked in the seam allowance and topstitched it down taking care not to catch the elastic. This did means a fair bit of pulling and tugging on the back waistband to get the elastic to sit well as I went round. I’ll be honest. I should’ve picked 2 light cottons for this project and made the blue tweed version separately. It’s come out a bit heavier than I would’ve liked. Still, it’s totally wearable and will be good to transitional seasons! Such a great idea and lovely execution! And Ogden cami’s! Thanks! It felt like it would be a good summer holiday skirt and versatility is always important for those! Especially with luggage weight restrictions! Lol.